Publishers and writers always hope for reviews of their books to appear just as books are released into the bookstores. In order to make certain that book critics and reviewers have time to read and evaluate the volumes advance copies are often sent off to various media outlets. These advance copies range from printed sheets ring bound with a printed light cardboard covers to close facsimiles of the final product. I wonder if these advance copies which may see ‘substantial changes’ before publication are a reason that writers wonder if the reviewer read their book. 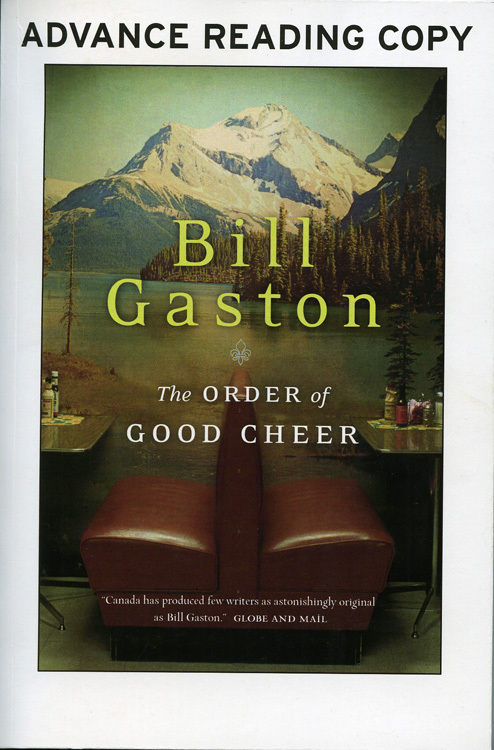 We had a chance to read an advance copy of Bill Gaston’s ‘The Order Of Good Cheer’ published by the House Of Anansi Press. Whether or not any changes occur, the version we read was excellent. The book is really two stories, one set in 1607 on the East Coast of what would become Canada and the other set now on the West Coast. The element that links the two are Champlain’s feast nights from which the book’s title is taken. How can you not enjoy a book that celebrates moose nose as a dinner dish. In the odd way that one book leads to another I found a copy of this narrative poem The Order of Good Cheer by Andrew Merkel published in 1946 by the Abanaki Press in Lower Granville, Nova Scotia. A beautiful little book with illustrations by Robert Chambers. I see www.davidevesbooks.com has a copy listed for $17. For those of you (and until now myself) who have no idea who Andrew Merkel was, this from the Dalhousie University archives. Merkel, born in New York in the mid 18880’s, came to Nova Scotia as a boy, became a journalist, historian and poet.